Essex Region 102 Pike Anglers Club GB: Essex Eelchasers, two new fishmeets as we await the new pike season..
Essex Eelchasers, two new fishmeets as we await the new pike season..
Hi, emails have been sent out, giving details on two fishmeets that are being held on Fri 5 Sept (overnight) and Sun 7 Sept (midday till dusk). The idea is to raise some funds for the Region, meet up and get slimey ! The Essex Eelchasers will be after the elusive eels, both meets are central Essex area, one of which could prove a real challenge. If you've never caught Eels by design, let us try and help out with bait and rigs etc, for old Anguilla is somewhat of an elusive creature. You're talking about a fish that can go without food for up to two years, swim backwards and climb up and travel over land. The fight from a specimen eel is certainly an experience you wont forget, you must not give them an inch. Although they eject hooks easily, deephooking is certainly best not practiced and the takes are often swift and savage, being sat over your rods is a must or you'll miss the bites ! Finding whether they take deadbaits or naturals like worm or maggot, sometimes they'll go for all three including sea deadbaits. The dropped runs or missed takes and eels coming off the hook are synonymous with the sport. The fish are mostly unknown and stocks vary, a water can produce just when you think it won't. We take you to two great venues for specimen eels and challenge you, as an angler, to pit your wits. If you are not a member, no problem if you'd like to join in the fun, just email essexpac@gmail.com for details of both meets. All we ask is a fiver donation to the Region once from all anglers. Speak to Sean Ellis RO now, if you have not received an email from us but want to come fishing :) Time for a challenge ! Don't forget you don't need to be a P.A.C. member to attend the Essex region's fantastic guest speaker evenings! The "102club" welcomes all pikers from novice to expert and a warm greeting to all on the night. We strive to be the biggest and best region in the country, but we have a long way to go! 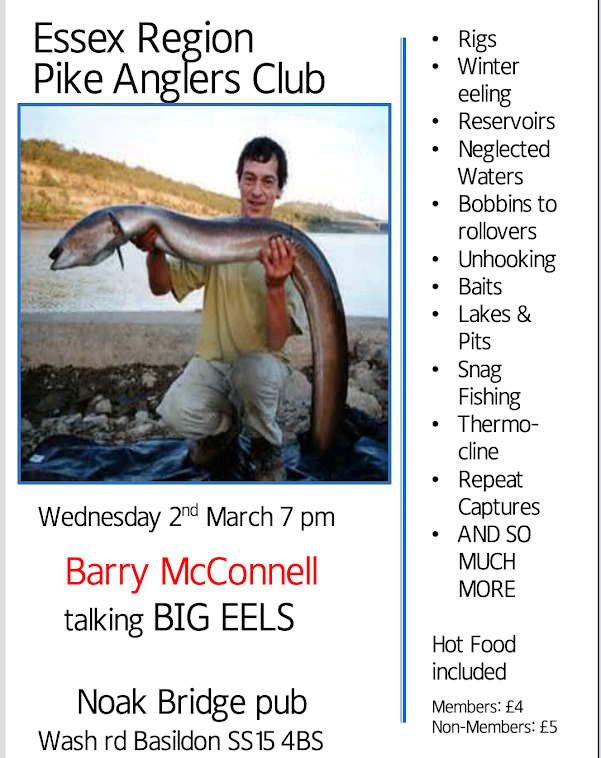 We intend to double our Pike Angling Club membership in our first year, so click on the P.A.C. logo beneath and join today, it's only a touch over £20 for the year. We have membership forms available at every meet or you can join online. At Essex PAC we do not charge a seperate subscription, we just ask you to join the PACGB ! The Pike Anglers' Club of Great Britain was formed in 1977 as a direct result of changing attitudes toward pike. For far too long pike had been regarded by fishery owners and some anglers as vermin, to be killed and removed at all costs. Since it's inception, the PAC has done much to drastically change this mistaken attitude and pike are now widely regarded as a positive element in the natural balance of any fishery; and are valued as a sport fish for all anglers to enjoy. 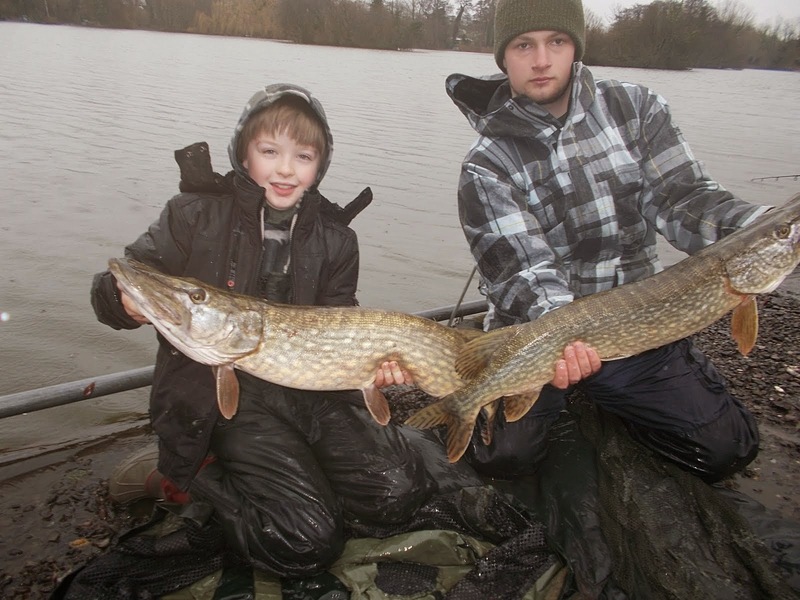 Pike fishing has without doubt become one of the most specialised branches of coarse fishing. Not least in the methods of handling, unhooking and safe return of the fish once caught. One of the most important aspects of the PAC's work is in helping young or novice pike anglers to overcome what for some are areas of difficulty. You may well have experienced that feeling of 'what do I do now', having just caught your first pike. You are not alone, many have experienced it and lived to tell the tale, thanks to the friendly assistance of PAC members offering sound advice and guidance. The PAC works continually for the benefit of all pike and pike anglers, we seek only to further the opportunities for pike fishing, whilst preserving all that pike fishing is all about. We strive to protect pike from persecution by those who do not understand, or choose to ignore, the facts about the important role the pike plays in the balance of nature. We also work to promote pike conservation through safe practice by anglers.